A highly effective hair tonic that strengthens and revitalizes irritated scalp and dull hair, using organic herbal extracts. If you suffer from flaking, excessive sebum production or hair loss, active agents from eight natural Phyto extracts support the regeneration of your scalp. Sensitive, fine hair gains natural volume and has the sensual aroma of Bulgarian Lavender oil. When stylist experience, biomimetics and aromatherapy combine, an innovative organic salon hair care line emerges, combining functionality, health and environmentalism with indulgent pleasure. Ecocentric is an online luxury organics shop offering the best in made in France premium organic and natural hair treatments. 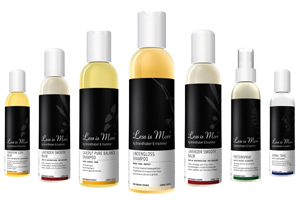 Unique and exclusive French luxury organic, ethical and natural hair care brands to buy a natural hair lotion for oily or fine hair, an organic nourishing and repairing hair mask for dry and damaged hair or a natural purifying scalp treatment.